Riad Al Janoub is an ancient merchant's house which has been lovingly restored in an elegant and contemporary Moroccan style. The 4 stylish and comfortable bedrooms are arranged around a courtyard with palm trees and a beautiful mosaic fountain. All rooms are ensuite with air conditioning and ipod holders. The rooms are decorated with hand carved furniture, rugs, mirrors and ornaments sourced from the souqs of Marrakech. All bathrooms are decorated using traditional tadalekt with hand beaten copper wash basins and beautiful Moroccan lanterns. The roof terrace, with its orange trees, has a large covered seating area and 3 sun loungers - the perfect place to relax in the sunshine or enjoy an evening sun-downer. Our housekeeper and chef, Amina, will greet you on arrival with mint tea and prepare you a traditional Moroccan breakfast each morning. Lunch or dinner can also be provided on request, served to you in the dining room, salon, or by candle light on our beautiful terrace. I am a primary school teacher and I live with my husband and 2 children just north of London. There are many parts of Morocco which we love but Marrakech has always been special to us. It's a great place to wander and there are so many chic restaurants and bars in which to spend the evenings. When we first saw Riad Al Janoub it was love at first sight. 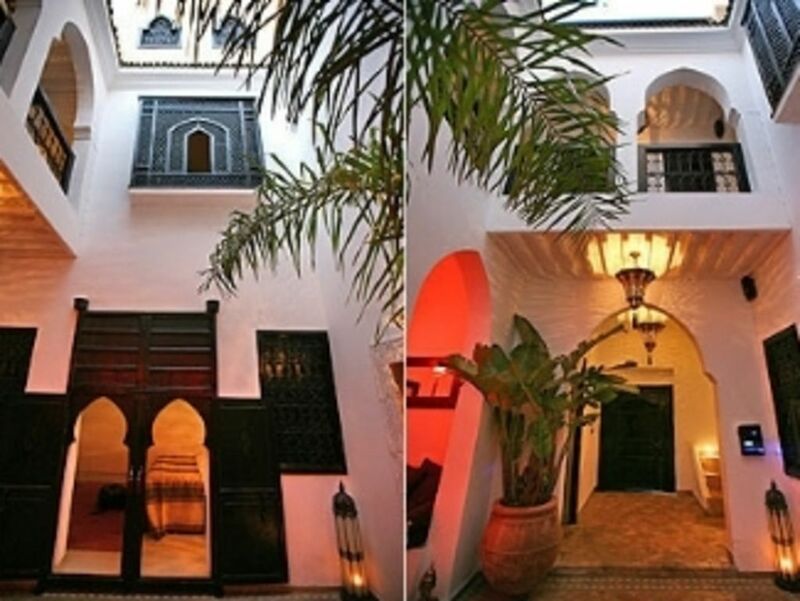 It's an ancient merchant's house which has been renovated in traditional Moroccan style with a courtyard and small fountain but with all mod-cons too. The 4 bedrooms are all ensuite with air-conditioning and iPod holders. We also have a lovely roof terrace which is completely private and great for sun-bathing or an early evening sun-downer! We have 2 lovely fireplaces - one in the salon and one in our Urjuwani master bedroom. If you would like the fire lit, please just ask Brahim who will be only too happy to oblige. Our beautiful roof terrace is ideal for sunbathing and early evening sun-downers. For those that want to say that they have ski-ed in Africa, the resort of Oukaimden is about 1 hour away in the Atlas Mountains (December to February only). Transfers can be arranged on request. Marrakech has a number of golf course within 20 to 30 minutes of the medina. Transfers can be arranged on request. Notes on accommodation: - DVD player/TV in dining room - iPod holders in all bedrooms - CD player in courtyard - Internet and wi-fi access (coming soon) -Amina, our housekeeper and chef, will prepare a traditional Moroccan breakfast each morning and on request can make lunch or dinner too. However, if you want to use the kitchen there is a cooker, fridge-freezer and washing machine. Amina is on hand for all your needs. Towels (both for the bathrooms and for the roof terrace) are provided and linen is changed on a regular basis. Outside: Our beautiful roof terrace - unlike many others in the medina - is entirely private, not being overlooked by other riads. With its orange trees, sun-loungers and covered seating area, it is ideal for sunbathing, sun-downers or dinner under the stars. This was a great Riad to stay in. It has a very family like atmosphere, located in the Madina very easy to finad. The hosts are awesome and will meet you with hot mint tea upon arrival. The breakfast if fresh every day. The accommodations are very nice with private bathrooms. There is a terrace on the roof that can be used when the weather is good. We enjoyed our stay there and definitely recommend it to anyone looking for an authentic stay in Marrakech. I know that we will stay at this Riad next time we come to Marrakech at a very reasonable price. The owners also arranged for us to be picked up and dropped off from airport so that we do not have to worry - and the price for this service is super reasonable. Thank you for a wonderful hospitality. Desert safaris, excursions to the Atlas mountains, and quad-biking all available on request. Essaouira is about 3 hours by car. The blue and white coastal resort has its own medina and is acquiring an increasing reputation for surfing and wind-surfing. Transfers (for either day trips or overnight stays) can be arranged on request. Marrakech Menara (RAK) is a modern international airport and just 7 miles or 10 km away from the medina. We are happy to arrange transfers to and from the airport on request. Riad Al Janoub is in the heart of the medina, just a few minutes walk from the bustling souqs and the amazing Jemaa El Fna. We are close to a number of chic restaurants and just 2 minutes from Yacout, perhaps the most famous restaurant in the whole of Marrakech.